A small Canadian town hopes to become a tourist attraction thanks to the internet fame of a homeowner's giant rhododendron. 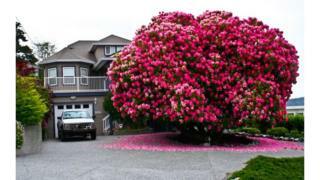 The 25ft (7.6m) by 30ft bush in Ladysmith, British Columbia, is now in peak bloom and putting on quite a show. The 115-year-old botanical wonder - known as Lady Cynthia - will carry about 4,000 spring blossoms over the next couple of weeks. The rhododendron is often confused for a tree but is actually a shrub. Former Ladysmith councillor and local historian Rob Johnson, 73, has convinced the town's Chamber of Commerce to promote "the marvel of nature" as an attraction. "It's the size of a small house and is a vibrant pink colour," said Mr Johnson. When it is not in bloom, Mr Johnson says it is "just a nice, big, green shrub". He said he realised "we should capitalise on this" when he saw the rhododendron attracting comment online. Local residents in the town of 8,100 have grown accustomed to the huge shrub, which has been in Ladysmith since around 1904. The first owners of the property are said to have brought Lady Cynthia to the forestry community on a sailing ship from Scotland. Clearly visible from Ladysmith's harbour, the rhododendron is on a hill in front of a home owned by a lawyer from Texas at 226 Kitchener Street. Ladysmith's rhododendron is so named because it is a Cynthia hybrid of the plant. It was first developed in Devon, England, in the mid-19th Century, but thrives in the mild climate of the Pacific Northwest.